Baku Baku is a Puzzle game, developed by Sega AM3 (Amusement R&D Dept.#3) [Hitmaker] / Sega Enterprises, Ltd. and published by Sega Enterprises, Ltd., which was released in the United States of America in 1996 for the Sega Saturn. 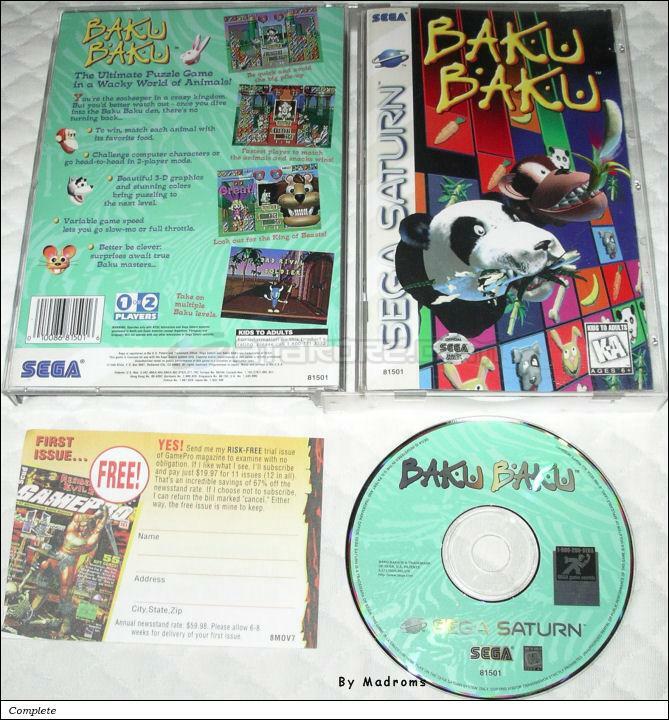 Baku Baku is one of the few Sega games which started in the arcade and later made it to the Saturn. It should be noted that the Arcade original used the STV hardware, which was basically a cart based Saturn in an arcade cabinet. The actual Saturn version is, therefore, 99% arcade perfect. The only deviations from the arcade original is the CD Audio music which lacks looping. But on the plus side, the Saturn version gets an exclusive remixed set of audio tracks (and a few bonus ones as well! ), FMV intros and outros, and extra game modes. So what is Baku Baku anyway? It's a grandiose Zookeeper contest, which translates to a mindboggling tetris-style game. The game blocks are made up of various animals & their food (Dog, Rabbit, Panda, Monkey and Mouse, paired with bones, carrots, bamboo leaves, bananas and cheese, respectively) which you have to pair up. To make things more straightforward, the corresponding animal/food types are also marked with the same color, a small touch but very convinient in the long run. Once you pair up an animal with his food, it will brake out of its block and literally munches up all the food blocks put next to it. Once it is done, the animal will disappear. Unless you feed plenty of food to the animal, in which case it will run off and harass your opponent in the form of random blocks falling into its playfield. As with any versus-style tetris clone, if a block disappears, anything above it will fall down, making it possible to create chain reactions with attack power exponentially growing. Your player characters (a girl for Player 1 and a boy for Player 2) will follow all attacks with different comments, based on their strength. Baku Baku is quite simple and addictive, but yet it has a few problems. At the very least, it has two of them. First is the lack of attack countering. If both players create a supersized attack that can fill up the other side instantly (around 68 blocks), both of their screen will be filled up instantly - the winner being determined by whoevers field gets filled up later, often based on microseconds of action. More advanced puzzlers, like Puyo Puyo, have a counter system, in which every attack you make will first cancel out any hits you are about to get yourself. The lack of this countering can lead to frustrating double KOs where, unexplainably, one player wins over the other by what seems to be the sheer random luck. The other major issue is, well... the sound of the animals gobbling up their food can get annoying after a while! But even then, Baku Baku is a very fun game, one of the few puzzlers with a unique, memorable style. However, if you mainly play in multiplayer mode, you may want to pick Super Puzzle Fighter 2 instead, it follows the exact same pairing gameplay, but with much more fair multiplayer rules. I should also mention that the PAL version of the game is full screen and features an exclusive disco remix audio track (that uses a great amount of sampling of sound effects both from the game and the Saturn CD Player) not found in any of the other releases. As the japanese exclusive "League Mode" is still unlockable by a cheat code (press B, A, C, Up, B, A, C, Up on the title screen, spelling out BAKU BAKU), this is one of the few times where the PAL version is actually the most feature-full release.